Born of English father and an Irish Mother I and a brother were educated at the Salesian Roman Catholic College, Chertsey in Surrey. I left at the age of sixteen to be employed as an Unestablished Clerk at Weybridge police station. This was the war years (1943) and I was also a Cycle messenger. My private interests were membership of the Air defence Cadet Corps, Brooklands Squadron, later to become the Air Training Corps. My father owned his own business as a greengrocer and fruiterer and I used to help in hs shop in Addlestone as did my mother. Our home was behind and above the shop. My father was a special constable eventually to be appointed inspector. I was conscripted into the army at the age of eighteen and after initial training at Maidstone Barracks I was transferred into the Duke of Cornwall’s Light Infantry and trained with them at Colchester. This was 1945 at the time of VE Day but the war with Japan was still being fought. Our unit was ordered to Cairo in Egypt and I was promoted lance corporal. It was planned that out unit would be redeployed to Greece but when in Cairo I was approached by a senior officer who was aware I had been attached to the police and asked if I would transfer to the Military Provost. I would be promoted to the rank of sergeant so I agreed. The international situation dictated that we were to leave Cairo but remain in Egypt in the Canal Zone and Provost Unit then transferred to Fayid on the canal. I was placed on the staff of Lieutenant Colonel Scott and as many people were coming to the end of their war service conscription in 1945 I was promoted Warrant Officer Class 2. I served until my conscription was drawing to a close (1948) and Colonel Scott asked if I was willing to join the regular army with a quartermaster’s commission as a Lieutenant. I declined, thanking him for the offer, but I had plans to join the Metropolitan Police on my release from the army. I returned to the UK by sea as were all trooping movements, and enjoyable it was. On this trip the liner was full of former members of the Palestine Police as they withdrew from the country. I joined the Metropolitan Police in 1948 and trained at Peel House in Victoria, being sworn in and posted to “A” Division, Cannon Row. It was usual for tall PCs to get this posting and as I was six feet three inches, this was not unexpected. I lived in the section house in Ambrosden Avenue, Victoria looking onto Westminster Roman Catholic cathedral – good for a young catholic lad! My room was opposite the Cathedral hall which had perfect acoustics with many great orchestras and choirs rehearsing there. At Cannon Row duties were almost full time on guard or protection posts for long hours with short beats and a return to the post. We were armed with .38 revolvers tucked beneath our jacket flap. Some of the posts were standing outside Number 10 Downing Street, the Foreign Office, and Buckingham Palace etc. We were there because Jewish terrorist groups from Israel were active in the country and had been responsible for a number of bombings and assassination threats. After a year I had enough and resigned from the Metropolitan Police and was firstly employed by a very large firm in Covent Garden (Fruit and veg.) as an assistant to the transport manager. This was a temporary move as I had applied to join the Surrey Constabulary being accepted in December 1950, with my twelve months in the Metropolitan Police counting towards my pension. My training was accepted and I was immediately posted to Leatherhead. I was a keen motor-cyclist and had my own Norton 500cc. I performed beat duties in Leatherhead and Ashtead, followed by divisional motor cycle duties at Reigate and Horley for several years before moving to Traffic at Burpham again as a motor-cyclist. It was now 1956 when I gave up my freedom becoming engaged to a catholic Margaret Angela Stewart from Curling Vale in Onslow Village, Guildford. We set a date for some eighteen months ahead, however in the mean time volunteers were called forward to serve in a police unit in Cyprus. The appeal was directed to all the UK police forces and I with several other constables from Surrey volunteered, with constables being offered the rank of sergeant in Cyprus. Mr Ted Post a sergeant in a Sussex force was promoted Inspector to be in charge of our volunteers as well as a number from other forces. (Ted Post was to become DCC in Surrey). It was considered too dangerous for wives to be allowed to accompany their husbands and Margaret when told what I had done, faced the situation bravely agreeing to get married on the 4 August 1956. Bomber brown the motor cyclist from Burpham Traffic made the wedding cake! I made over to Bomber my new model Norton motor cycle which in due course I was to re-claim after he had enjoyed its use for two years. A short honeymoon followed and after a few days our newly formed unit flew to Cyprus. My action may well be viewed as cruel to dear Margaret but what followed after a few weeks on her part set the seal on a firm and successful marriage. It is too much to report on the full situation we found ourselves in Cyprus other than to say we faced grave risks, which to be fair we were well aware of before we left home. The main concern was the Greek terrorist organisation E.O.K.A. under the leadership of General Grivas. The Cyprus police force consisted of both Greek and Turkish officers and the British Bobby was there as it was suspected that EOKA had infiltrated the force. Within two to three weeks we suffered a great tragedy. Three of our Unit, not Surrey officers, when off duty decided to enter the city of Nicosia to shop for a camera in Ledra Street, known as murder mile. Two were shot dead and the third survived the attack by the terrorist Nicos Sampson who was arrested much later in the Trudos Mountains and sentenced to death. The punishment was not carried out as he benefitted from an amnesty. At this time I was posted to Famagusta with other officers. Margaret meanwhile had obtained a contract to work as a secretary in Nicosia. She flew out meeting on the plane the daughter of the District Commissioner for Famagusta whose secretary had returned to the UK. The daughter spoke with her father and Margaret was appointed his secretary and we were back together given she was in Nicosia and I was many miles away. The whole scheme was her idea and I had no knowledge of her plans. Imagine her torment and that of other families when the English press the following morning carried photos on their front pages and reporting that the two bodies lying in the road were those of recently arrived police sergeants before the next of kin had been informed. I was contracted to remain Cyprus for two years and that was enough for me. Margaret was expecting our first child and was released from her contract and we flew back together to England. I reported to HQ and the DCC allowed me to choose what I would like to do next and I chose CID and was posted to Godalming to replace Maurice Jackman who was moved to Guildford. We move to the police house Maurice vacated on Holloway Hill, Godalming. My police career now really started. It was very exciting because at every stage and every rank I was a poor delegator. I had to get involved, particularly when the Metropolitan Police District was involved. For much of my career I was working close to the county boundary or “border” and what now follows is a brief resume of that career up to my retirement. I was very happy at Leatherhead, and after a CID attachment, a short spell on motor-cycle duties I returned to CID. After failing more than one I passed my sergeant’s exam and then the Inspector’s examination. After a number of years I became a detective sergeant transferring to Oxted where I worked under several excellent Detective Inspectors including John Over who one day was to become Chief Constable of Gwent. By now Margaret and I had three sons, and so imagine studying for exams, being a poor delegator and having Croydon on our door step. I was a very busy man! John Over stepped in: “Paddy you are not delegating enough. I’ll take the bells over night and you must study more!” Eventually I passed the exam, top place in Surrey. After I left CID I served as a deputy to a number of Superintendents at Addlestone where I now lived in my own house. I was very happy, having had enough of CID work and after about eight or ten years, I had a visit from the ACC, Chris Rowe. He told me that the Chief Constable wanted me to return to Caterham and wanted to see me in his office. I declined the offer. Rowe annoyed me with his attitude – I deserved better. I did not get the meeting with Sir Peter however when I was due to retire he remembered me, and in fact did me a favour. John Maskell former ACC Surrey and deputy head at the Police College had retired and appointed consultant on security matter with Unilever. 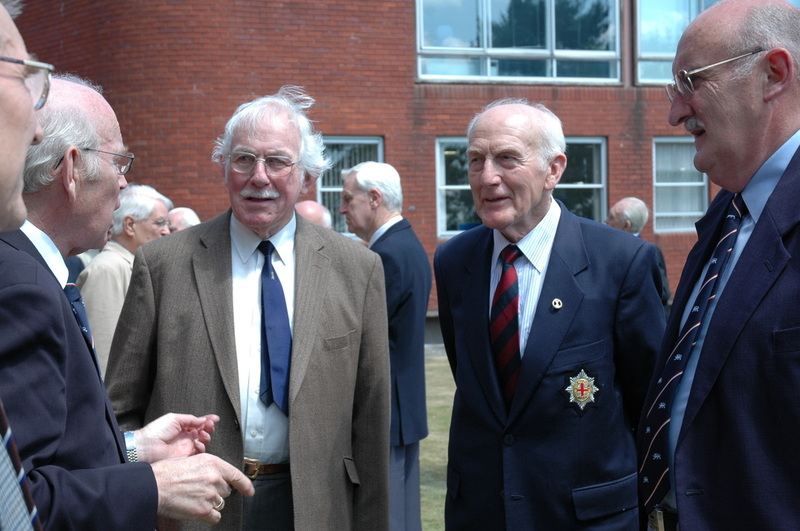 (This was a position normally taken by retired senior met officers) John wanted to form a team of investigating officers and approached Sir Peter who recommended me. I was approached by John who said the role was to be advertised and recommended I applied which I did as did many others, and after interview I was given the job. John explained that Unilever were suffering large losses in the distribution of frozen foods and asked how I would approach the matter to which I suggested forming an under-cover operation. I was to have my office in the Birds Eye/Walls offices at Walton on Thames where I formed a mini crime squad concentrating our actions on four large distribution centres in the London area. We were equipped with car to car radios, a wireless equipped motor-cycle and an observation van. I had recruited four ex police officers and we worked very closely with officers of the Metropolitan Police and Crime Squads. We were very successful in reducing losses and I was upgraded from Company Security officer to Corporate Security manager. Our security team was increased and I recruited ex-police officers in the West Country, the Midlands and Scotland. I remained in this position for some nine years and after the distribution sector of the business was sold I retired early with a Unilever pension and a very considerable financial hand-shake for having to leave early!